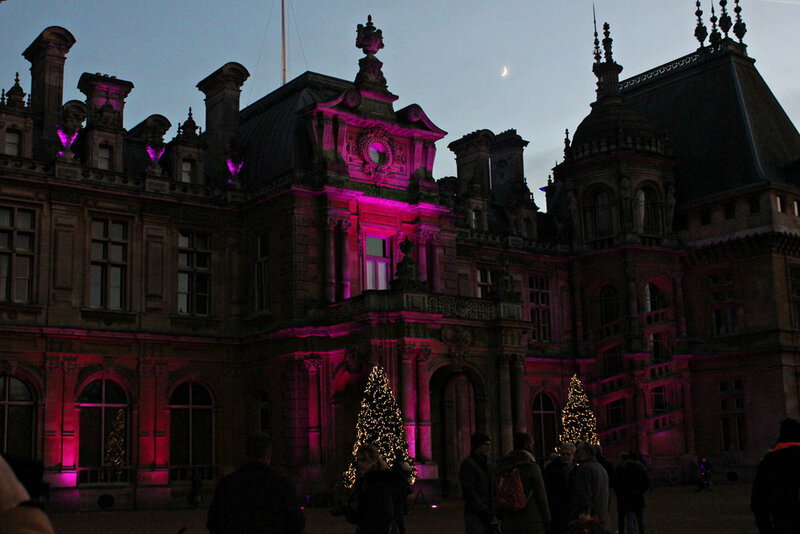 We arrived at Waddesdon Manor dead on 11 when it opened and left as night fell. There is so much to keep you here and the only reason to go home is exhaustion or frostbite. We were prepared for both with lots of treats and even more layers. With 200 acres to get through the grounds here are immense. 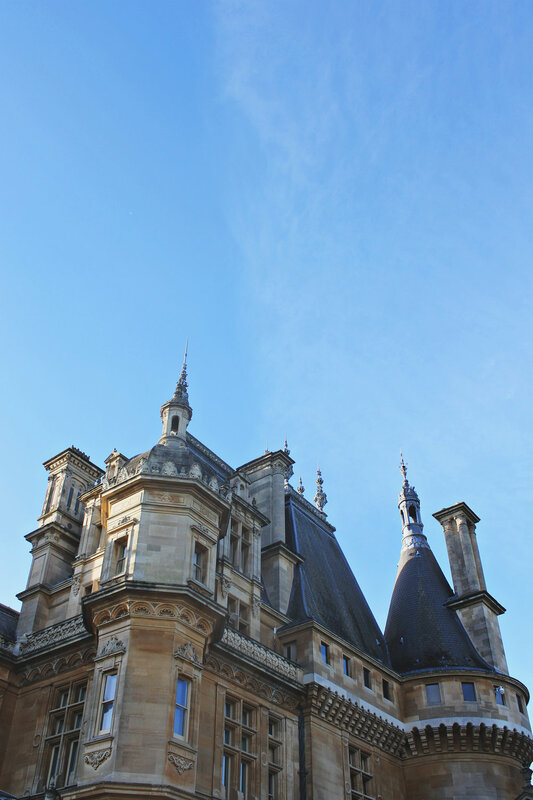 They are dotted with sculptures, beautiful trees, fountains and immaculate Victorian gardens. We spent a fair while at the aviary ticking off every one of the exotic birds on show. The boys climbed trees, had races and got very muddy - it was exactly what we needed on a winters day. The playground is carved from a hill winding through the trees and is spread out over 3 sections and there is something for all ages. Little ones can play safely at the bottom of the hill on seesaws, swings and soft bark, whilst the rest is set out for older children complete with climbing frames, zip wire, den building area and huge tube slide. Next up was lunch. The heated wigwam looked very inviting with delicious smelling street food, but we opted for a Waddesdon packed lunch down at the stables whilst snuggled up in the blankets on sheepskin rugs. Then on to see the manor house re-created in gingerbread form by the very talented people at ‘the biscuiteers’. Spread over 2 metres with intricate hand iced replicas of the house, its paintings and furniture - it looked good enough to eat! We were getting chilly now so on to the house to see it all decked out in its Christmas splendour. The children’s trail around the house ‘jolly gingers’ kept my little gingers entertained throughout the whole tour, as they spotted decorated gingerbread men and collected stickers. They really have pulled out all the stops decorating the house with huge elaborate Christmas trees and tables set for feasts. At dusk the house and gardens are spectacularly illuminated with rainbow colours changing in time to music throughout the evening. The field of light installation by Bruce Munro rounds up an amazing day. I thoroughly recommend this outing in the middle of winter when you need to escape outside to keep everyone sane. Ticket prices vary through the year but it is free for National Trust members. If you want to see the house at Christmas you need to book in advance, but if you miss out on this you can turn up on the day at opening time and tickets are given out on a first come first serve basis, which is how we got our tickets. Our timed entry to the house was rather late in the day, but we spoke to the gent on the door of the house and he very kindly let us swap our times. I think the children were looking pretty chilly and he thought they needed warming up inside! Don’t put your kids in anything you don’t mind getting covered in mud. The boys were filthy by the end of a day with all that running around in the grounds, the playground, oh and the obligatory wrestling. The kids packed lunches at the stables are very good, almost as good as the hot chocolate mmmmm. The estate is well known for its statues throughout the gardens, but if you want to see them you will have to wait until the weather warms up as they are all hidden away under their covers for the winter. Cassius spilt hot chocolate over every item of his clothing and whimpered all the way back to the car because he was freezing. His little feet were red raw with the cold by the end of the day – we need to invest in some better winter gear for him! Noah tried to frighten his brothers with a boo and it backfired ending with him being punched in the face as a sort of reflex action from Beau (I begrudgingly gave him the benefit of the doubt).